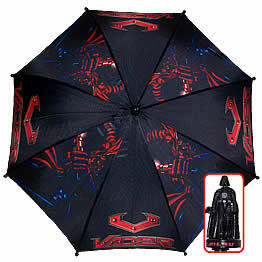 Nylon kids umbrella with plastic Darth Vader shaped handle. Round plastic safety tips. Push to open, pull to close. Wrist strap. Velcro close umbrella strap. Background color of umbrella is black.